Eric was full of energy…an energy that propelled him and drew others to him. He had a gleam in his eyes, a smile on his face and a loud contagious laugh. Eric was fun; he brought life and laughter to any occasion. His passion for sports was evident from the time he was a young boy. Eric began playing in-line hockey at 6 years old. Initially he played goalie, then the coach suggested that he play on the line because he was fast and a strong skater. Eric played on numerous hockey and tournament teams. When Eric was 12 years old, he wrote: “My favorite two sports are hockey and football. I like them because you get a lot of action. I’ve played hockey for six years and am getting tired of it. This year I finally convinced my parents to let me play football. I love football because you get even more action than hockey”. Due to the summer time commitment, Eric decided not to play football in his junior year of high school. When the season rolled around he said “mom it’s killing me to not be on the field playing”. That’s when he became the self -appointed mascot and crowd instigator at the high school football games. He slathered his body with black and gold paint (his school colors) and draped himself with a black and gold stuffed snake. He could stir up a crowd (in a positive way)! While always remaining active in hockey, Eric tried many other sports along the way. He swam, played baseball, soccer, basketball, track and cross country, volleyball, and football then found that he loved playing rugby. Eric started playing rugby on the high school team but was quickly moved to the adult semi-pro team due to his passion for the game, intensity and speed. The physicality, the contact was one thing but there was something about the connection these guys had. After each home rugby match, the team would invite the opposing team to stay and join them for a cookout or pig roast at their clubhouse. They would gather there to watch the Steelers football games and the Penguins hockey games. The guys pitched in and worked to keep their field in pristine condition and the club house clean. Eric enjoyed that camaraderie. Eric also enjoyed bicycling, skiing, snowboarding, water skiing, wake boarding, scuba diving, windsurfing, and four wheeling in a jeep wrangler. As you can see, he was active and adventurous. While Eric had that intense love for sports, he also had a passion for life. Family and friends meant a lot to Eric. Whatever anyone needed, Eric was ready and willing to lend a hand. He also cared deeply and was an intent listener; he had a way of making everyone feel that what they had to say was important and interesting. Eric was the son, brother, grandson, nephew, and friend that everyone loved to spend time with. He was the life of the party and always had an entertaining story or two to tell. Faith was a huge part of who Eric was. Eric was an altar boy when he was younger, when he was a junior in high school he decided to teach 4th grade CCD (religious education). Eric managed to pack a lot into his days; he excelled academically, volunteered, and worked part time at the family business, all while playing on multiple sports teams and enjoying time with family and friends. He had a strong drive for success and passion for life itself. Anyone that knew him had no doubt that Eric could accomplish anything he set out to do. The intensity with which Eric played sports resulted in three documented concussions; one each year for three consecutive years. The first one (in his sophomore year) playing football for his school team, the second one (in his junior year) from a pick up football game with friends and the third one (in his senior year) while playing rugby for the Pittsburgh Harlequins. That concussion received on September 30th 2006 during a rugby match was different than the others. Eric collapsed on the sidelines holding his head and groaning in pain. He was rushed to the hospital and remained there for two days. On the third day he was released and the only restriction he was given was “no contact sports for 3 months”. At that point, Eric asked if he could run and lift weights so he didn’t get out of shape. He was told that would be okay. Eric was concerned about getting behind in his school work and pushed himself to go to school and get caught up on missed assignments. He was tired and had headaches but continued to do a little more each day. When I asked him how he was feeling and if he felt a little better each day, he said “yes”. He was released from the hospital on a Monday; one week later he went to the school’s work-out facility with a friend to lift weights. Ten days after Eric’s rugby concussion and seven days after his release from the hospital …….the day after he lifted weights…...as we sat down to our family dinner and said our prayers, suddenly the unthinkable happened. Eric’s body stiffened with clenched fists, his eyes rolled back in his head and Eric collapsed with horrible sounds coming from his airway. We immediately called 911 and performed CPR until help arrived. He was taken to the hospital and pronounced dead. Eric’s brain had swollen and herniated, cutting off his breathing and heart rate. We have since learned that Eric had sustained a head injury on September 16, 2006, just two weeks prior to the severe concussion on September 30, 2006. Eric was 18 years old; he had recently been moved from the high school team to the adult semi-pro team. The team was driving from Pittsburgh, Pa. to Baltimore, Md. to play a match and return home that night. As I was making plans to go, Eric convinced me that I should stay home and spend the day with his younger sister. He said, “Mom, I’ll be fine, and I’m concerned about Jenna having to spend so much time at my games; spend the day doing something fun with Jenna”. I understood what he was saying and I also understood that he was on the adult team and wanted to go with the guys. He was no longer playing on a high school team and nobody else’s mom was going to drive to Baltimore for the match. He wanted me to give him that freedom. As a mom that always worried about injuries, that was difficult for me, but I relented. When Eric got home that evening, he was tired. He sat in the family room with us for a brief time and said he was exhausted, was going to shower and go to bed. Considering they had driven four and a half hours, played a physical match and drove another four and a half hours home, it made complete sense that he was ready to call it a day. 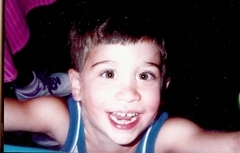 Eric loved life, and I’m sure he never thought he could die from complications of a concussion nor did we (his parents). Knowing what we know now, he most certainly had other undiagnosed concussions and too many sub-concussive blows to the head to count: slamming into the boards in hockey, running full tilt into a block wall in basketball so that he could backhand the ball to a teammate keeping it in play, etc. Eric was very competitive; he was intense and aggressive in every sport or activity he participated in. Learning that Eric’s brain showed signs of CTE (Chronic Traumatic Encephalopathy… deposits of abnormal, toxic protein, called tau) was shocking. For years we had enjoyed watching Eric give it his all as he competed in sports. He had so such passion and drive; it was fun to watch him. Eric thrived on the competition. Although I was always concerned about injuries, I didn’t know that damage could have been accumulating in Eric’s brain. All of the times that Eric accelerated and stopped quickly, his brain was hitting against the skull of his head. I urge parents, coaches and players to become educated about concussions and sub-concussive head injuries. Never, Never, Never, let an athlete return to play with a brain injury that is not completely healed. No game is worth it. Emphasize this with your sons and daughters. It’s not “just a concussion”. They must understand that every head injury is serious and requires both physical and mental rest. The brain needs time to heal. I am not trying to dissuade children from participating in sports. Playing sports has many advantages: physical fitness, confidence, learning to work hard, sportsmanship, trust and working together with teammates. All of these produce more than victories on the field-these skills are tools used in everyday life. I am promoting safer play, receiving proper care in the event of a concussion and gradual return to play when completely symptom free. Information about concussions is much more readily available today than prior to Eric’s death. Although information is available, there are still many people that don’t know what to do or not do if they receive a concussion, there is still a need for education. You can read more about Eric’s story in “CONCUSSED” a book written by Keith Primeau and Kerry Goulet. Keith and Kerry were both professional hockey players who formed Stop Concussions after retiring due to concussions. They work tirelessly to educate athletes, coaches and parents about concussions, emphasizing safe play and respect for oneself and the opponent, along with proper management of concussive head injuries. Each year we award The Eric Pelly Memorial Scholarship at a 3 on 3 Basketball Tournament at North Allegheny High school. It started as a basketball game among Eric’s friends and the teachers at his high school and has progressed to a basketball tournament with community involvement. In recent years, we have had 30-35 teams compete. While enjoying the great competition, we focus attention on Concussion Awareness and increasing knowledge about concussive head injuries. It is important to our family to do everything we can to prevent a tragedy such as Eric’s from happening to anyone else. On October 10, 2012, the 6th anniversary of Eric’s death, we showed Chris Nowinski’s “HEAD GAMES” documentary at the Harris Theater in Pittsburgh. That evening, a teacher/coach that has played in the Eric Pelly Memorial Basketball Game stated that because of what she had learned during our event, she had stood her ground and refused to allow a girl to return to a basketball game (after hitting her head) against all the resistance she received. Later that evening, the girl had a seizure and was hospitalized. Not allowing that girl to return to the game may have saved her life. It is with great pride that I say, collectively, we are making a difference.